If you recognize that you are not taking action because of unconscious blockages, or you’re not getting the results you want with your sales despite application of the system; then it’s likely that you need to have a look internally. In the pack there are 3 Audios. Audio 1: Fast Start Guide: This audio covers why we have fears and where they come from and an introduction to the processes to over come them. Audio 3: Pre-presentation Visual Rehearsal: This audio has my process for getting myself mentally and emotionally prepared before EVERY presentation I do, no matter how big or how small. It contains positive suggestions for success that are designed to go sraight into your unconscious mind, and visual rehearsal so you experience your ideal result before you go out and create it. This is a VITAL habit to get into if you are serious about becoming a successful speaker who makes money! 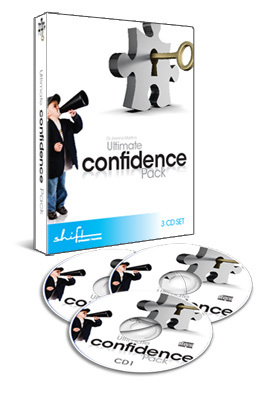 The Ultimate Confidence Pack retails at $137, but because you’re a member, and realistically this is information that you absolutely must have to take your game up another level, when you follow this link you will go to a special members only page where you can get download the audios for ONLY $37. Congratulations on taking action. I assure you this set will kick your game up to the next level. P.S. Yes we offer a 100% Money Back Guarantee. If in the unlikely event you are not satisfied with the Pack please let us know and we will offer you a prompt and courteous refund.